Broadcast communication has had a profound effect on modern society in the 20th and early 21st centuries. A growing international field of research has examined the historical development of broadcasting within various social and historical contexts, but also has made significant contributions to the understanding of media communication in general. Central topics in this discussion concern the relationships between technological innovations, institutional arrangements, social relations and culture. This book analyses the historical developments of Swedish broadcasting from the introduction of radio in the mid-1920s until the early 2000s. In relation to international research, it explores key aspects of how broadcast media emerged as a way to communicate over distance, connected to audiences, and evolved into central institutions and socio-cultural universes in society. The chapters are arranged in five thematic sections focusing on the invention and early development of radio and television, audience orientation, professional practices, broadcast genres, and institutional changes. 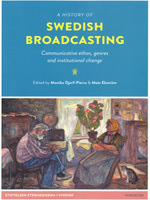 The book derives from a large-scale research programme on Swedish broadcast history comprising about 50 studies and led by the "Swedish Foundation of Broadcast Media History".